Chevrolet Beat Diesel Vs Maruti Suzuki Ritz Diesel – Which Is Better And Why? Chevrolet Beat Diesel is latest baby in the small car segment and as immediately as it entered the market, the competitions seems to have risen. To help buyers we are working on our car comparison series on Car Blog India and as we advance through this comparison post, we would come to know which is a better buy between Beat Diesel and Maruti Suzuki Ritz. The Beat diesel has already been compared with Ford Figo where the two were concluded to be at par as far as features are concerned, but the Beat defeated the Ford Figo in terms of pricing. Let us find out, if given a choice, which one to buy, a Ritz Diesel or Beat Diesel. Since looks matter a lot for aspiring buyers, a has to have some attraction so that it could draw attention. The Beat certainly has than unique road presence and attraction that a buyer seeks, the Ritz isn’t bad though. If you seek sportiness, Beat has got it and features than help the car attain such levels of sportiness include, the roof rails and, beautifully designed fascia with expressive headlamps and uniquely placed rear door handles giving it a look of a coupe. Coming to Ritz, the design is as simple as any other product from Maruti Suzuki. Although it looks simple, the car is attractive enough for potential buyers who need a simple on design car with the Maruti badge. From the hood at the front to the rear, everything seems to be plain with no expressions at all but still somehow it manages to reflect some aggression. Alike the Figo which managed to beat the Beat in dimensions, the Ritz also leads the Beat in length, width and height, The wheelbase of Beat is marginally more than Ritz’s but that is of less concern as for the rest of the proportions, the Ritz is ahead of Beat making it slightly roomier. So for the looks Beat is our choice but considering the size, the Ritz leads. From the inside both the cars look quite contemporary with some uniquely designed portions. For example the central console of the Ritz is waterfall type with very conventional positioning of buttons. The Beat’s console along with the whole dashboard is way more sporty and beautifully carved. The cluster behind the steering wheel is very innovative in both the cars as both feature a single dial for a clean view. The tachometer which tells the rpm is placed on the dashboard right next to the steering wheel in Ritz. On the steering wheel the Ritz features mounted audio control which are absent in Beat. Fabric inserts and a number of other features are common in both the cars so we would consider highlighting features only. 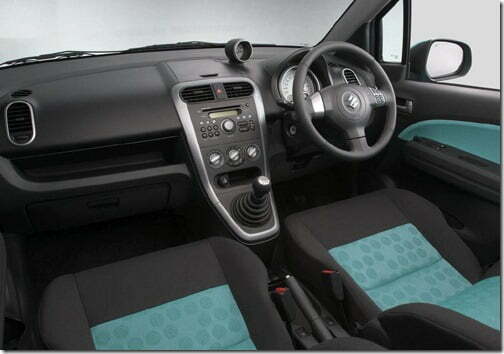 The Ritz equips , ABS with EBD, ELR seatbelts with pretensioner, dual airbags, central locking, iCATS immobilizer etc. 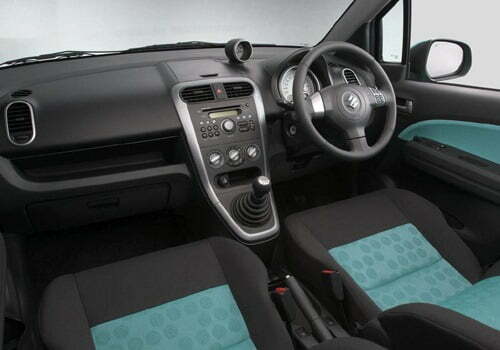 With no surprise ABS with EBD, airbags, central locking and others also come with Beat but as optional features. The Beat gets an audio system with radio and USB, AUX-in connectivity which is not present in Ritz. This certainly is a disappointment as people now a days play songs directly from cellphones or USBs avoiding the cost of CDs. So for interiors I would opt Beat over Ritz as every buyer needs some refreshment and Ritz does not possess that and gives a boring look whereas Beat’s interiors attract us as it’s exterior did. Technically the Ritz get a bigger 1248 CC engine with a power output of75 BHP and a high peak torque of 190 Nm. In terms of power and torque the Ritz outperforms Beat which gets a smaller 936 CC engine generating 58 BHP of peak power and 150 Nm of peak torque. But the Beat is slightly peppier than Ritz because of the low end peak torque of 100 Nm which kicks in early at 1250 rpm. Both are good for city driving but the best part is yet to be considered, the mileage. The Beat gets a best-in-class fuel efficiency of 24 KMPL which is way beyond Ritz’s reach. Beat starts at 4.29 Lakh INR and ends at 5.45 Lakh INR with its top variant bearing all the optional features whereas the Ritz starts at way above 4.74 Lakh INR and ends at 5.28 Lakh INR featuring ABS. One notable thing here is that the base Ritz starts at 4.74 Lakh below which you can buy the PS and LS variants of Beat which is quite interesting. Even if one is not going for the base variant of Beat and chooses the next one, still he is way below the price tag at which Ritz base can be bought.The top LT variant of Beat without alloy wheels, ABS etc. comes for 5.0 Lakh INR which is again cheaper than the Ritz VDI priced at 5.1 Lakh INR. But when we consider the top end variants with all the safety features and gadgets the Beat becomes pricier by 18k typically making it expensive. Not creating any confusions for you I would conclude that the Ritz is roomier, power packed and aggressive and the top end variant can be bagged for just 5.28 Lakh but if you consider the driving pleasure, price difference, performance and mileage figures the Beat certainly beats its foe.